Happenings with Dom and Nan: "GMOS, changing the human genome one meal at a time!" "GMOS, changing the human genome one meal at a time!" Natural News have teamed up with Infomatic Films to produce a cartoon video all about genetically modified organisms and how good they are - well, for Big Pesticide anyway. "GMOS, changing the human genome one meal at a time!" 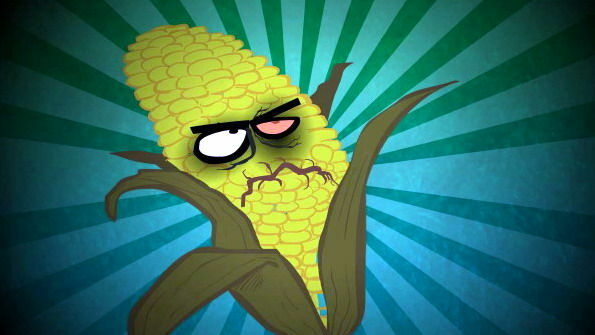 Made by InformaticFilms.com and sponsored by NaturalNews.com, the new animated cartoon video gives us all the basics on why GMOs are dangerous, as well as informing children, tongue-in-cheek, that they don't have to worry about eating good healthy vegetables any more. With a horror theme, we are gradually introduced to how genetically modified seeds and crops are made and how they produce pesticides within the plants to kill insects. We also find that these insects are now getting immune to the built-in pesticides as nature adapts to get around the problem. We are introduced to those silly scientific tests being performed on genetically modified organisms, where scientists are finding out that rats develop organ failure and tumors from eating GMOs. We are further introduced to those pesky farmers in India, who are being "recycled" in an effort to take away the debt from their families, as under Indian law, when a person dies, their debt dies with them. However, don't worry, Big Pesticide will find a way around that problem too.